A huge lumber pile at the mouth of the Black River was blamed for a collision that sank the ferry steamer Grace Dormer at Port Huron on July 25, 1883. Capt. 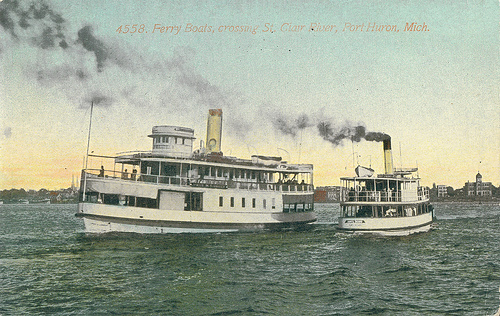 Ed Thomas, master of the seventy-six-foot long ferry, was criticized for running his vessel blindly out of the Black River and into the busy St. Clair River without blowing the boat’s whistle. But Thomas also was praised for daring action, which probably saved his passengers from drowning. The accident happened at about 1 p.m. as the Dormer was leaving on a regular trip from Port Huron to Sarnia, Ontario, just across the St. Clair River, with about thirty passengers. As the ferry cleared the mouth of the Black River Thomas was shocked to see the tug Frank Moffatt, operated by Capt. William O’Neill, appear down-bound on the St. Clair River from other side of the wood pile. The two vessels were on a collision course and only about a hundred feet apart. "I put my wheel hard to starboard to turn downstream and blew the whistle three times," Thomas said. "But the tug came right on, not altering her course a hair." The Moffatt’s bow collided with the port side of the Dormer, cracking the ferry’s wooden hull. Before the two boats separated, Thomas said many of the passengers and some of the Dormer’s crew jumped to the deck of the tug because it was obvious the ferry was going to sink. It was, of course, a race against time. As the steamer moved up the river it was settling deeper and deeper into the water. "Passengers were grabbing life preservers and getting ready to swim as I swung her up alongside McMorran’s Dock. It wasn’t necessary to throw out a gang plank or offer assistance to help anybody off. They were on the dock as soon as I was," Thomas said. Within two minutes the Dormer settled to the bottom in thirteen feet of water. The ferry was raised and put back into service. The Grace Dormer was built at Buffalo, New York in 1868. It operated on the lakes until a fire claimed it in 1925.